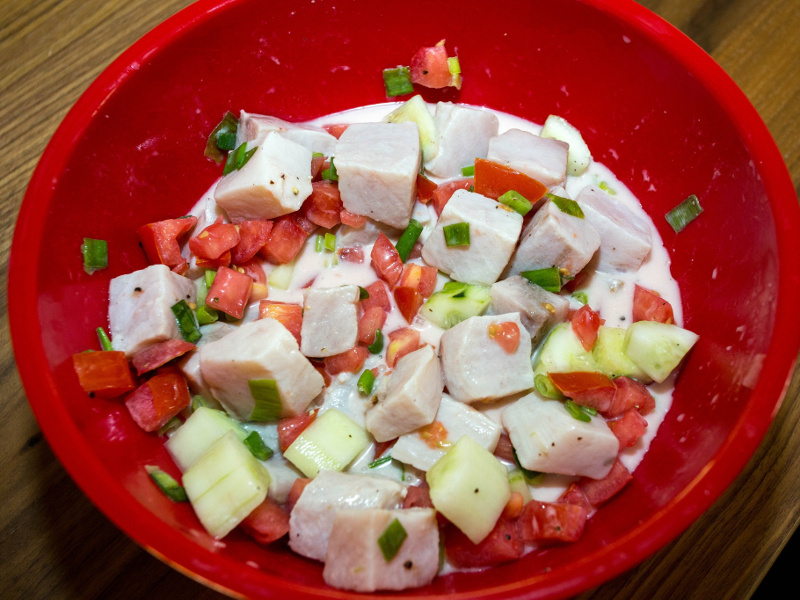 This famous Tahitian dish is similar to Latin ceviche or Hawaiian poke. It differs primarily in the addition of coconut milk, which softens its flavor. Poisson cru only marinates very briefly so the lime juice doesn't have time to "cook" the inside of the fish. The Tahitian name for poisson cru is e'ia ota. The same dish is called oka i'a in Samoa. Mix all the ingredients together in a large, non-reactive bowl and set aside to marinate for 10 to 20 minutes. Drain excess liquid and adjust seasoning. Garnish with some freshly chopped scallions and serve in a decorative bowl or large clam shell. Fish: Make sure to use very fresh, high-quality fish for this dish. Such fish is often marked "sushi grade" in the market. Use other fish — halibut, snapper, swordfish — if you like. Other possible additions: Cubed red peppers, grated carrots, diced red onion, minced garlic. Sometimes a pinch of sugar is added to take the edge off the dish's acidity.